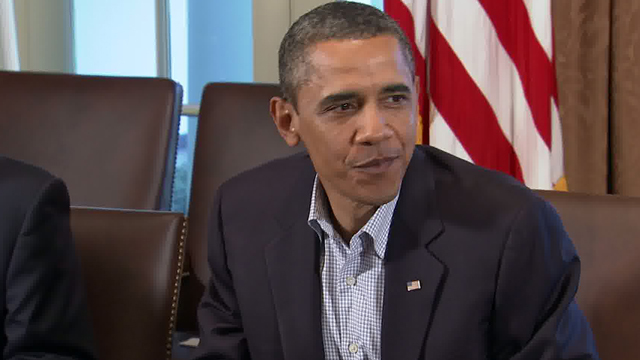 How is U.S. President Barack Obama handling the debt-ceiling talks? CNN commentators and newscasters weigh in. Negotiations on the federal debt ceiling have started kicking into high gear in recent days with the August 2 deadline to raise the U.S. borrowing limit pressing upon us. The financial markets, global leaders - and the pundits - are parsing every word of the debate that involves trillions of dollars. 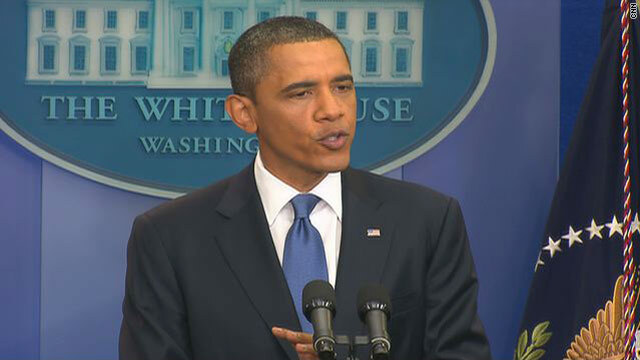 On Monday, President Barack Obama ruled out any chance of signing a short-term extension of the debt ceiling. He insisted now's the time to tackle the nation's most pressing fiscal problems comprehensively. He wants bipartisan compromise on both taxes and cuts to entitlement programs. His push for the largest deal possible is an apparent rejection of a call by House Speaker John Boehner to focus more narrowly on spending cuts agreed to in an earlier round of negotiations. A 6.2-magnitude earthquake struck the Philippines early Tuesday, the U.S. Geological Survey said. The quake's epicenter was reported to be in Negros, about 360 miles south-southeast from Manila. The quake happened at 4:47 a.m. local time Tuesday (4:47 p.m. ET Monday), according to the USGS. The earthquake had a depth of nearly 12 miles, the USGS said. There were no immediate reports of injuries or damage. 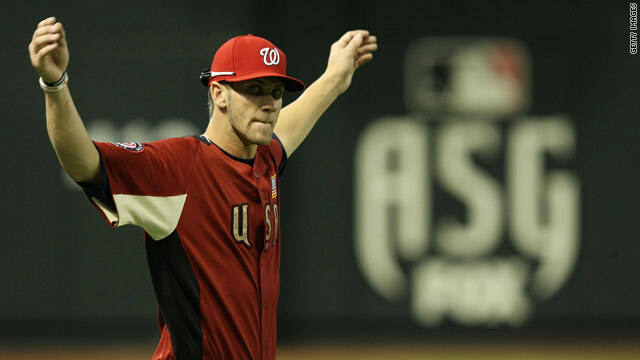 Nationals phenom Bryce Harper was hitless in the Futures Game, but he showed the tools that make him a top prospect. On the surface, Bryce Harper's performance at Major League Baseball's Futures Game on Sunday may have been a bit of a letdown. Finishing 0 for 4, Harper struck out twice and bee-lined two grounders to the first baseman. But as SI.com's Joe Lemire says, that doesn't even begin to tarnish the 18-year-old's array of accomplishments or dull his future prospects. "What Harper still showed on the day were his first-rate tools, even if he failed to use them in a way that made a difference in the outcome," Lemire writes. "It was, however, just one game. Players are allowed to have a bad game now and again, especially when facing a barrage of the game's best international pitching prospects, opposing the Braves' Julio Teheran, Mariners lefty James Paxton, Blue Jays' Henderson Alvarez and the Royals' Kelvin Herrera. Part of why Harper more than other toolsy players is on a major league fast-track is his in-game maturity: He takes walks and more often than not makes the smart throw." But despite the outfielder's maturity and skill, the Nationals have chosen to be conservative with their rising star, likely not calling him up to the majors this year to give him more time to develop. And that seems fine by Harper. 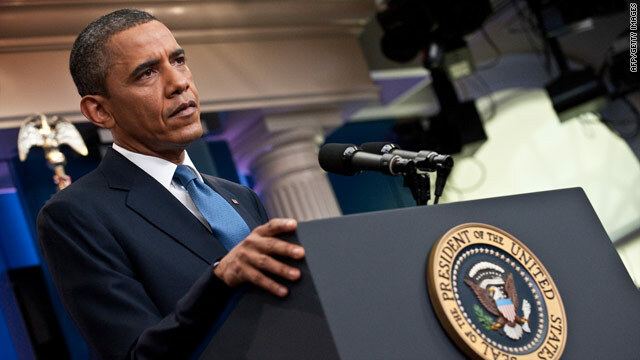 Despite continued disagreements across the aisle, President Obama talked tough during a press conference Monday morning, insisting that a deal to increase the $14.3 trillion debt ceiling will be reached before the August 2 deadline. If the president and congressional leaders fail to reach an agreement, Treasury officials have warned that a partial default could be triggered, which could lead to skyrocketing interest rates and a plummeting dollar. During his press conference, President Obama said it's time to "pull off the Band-Aid" and "eat our peas" while the GOP continues to insist on no tax increases. People who commented on the CNN.com story mainly agreed with the president and raised other concerns. A Motorola tablet runs the Android system. Newspapers are looking to become the biggest thing on tablets since the Ten Commandments, and the Philadelphia Inquirer is hoping to keep its product relevant by selling it with free Android devices. Publisher Greg Osberg announced Monday that the Philadelphia Media Network will begin providing free Android tablets for digital subscribers to the Inquirer and to the Philadelphia Daily News, according to a news release. This initiative is part of a $250,000 Knight Foundation grant to pursue digital journalism. The initiative is called Project Liberty. The Philadelphia Media Network will partner with Drexel University, DreamIt Ventures and the Philadelphia Foundation to develop new technology for digital media, according to the news release. Plans for the free tablets are still in development, and the specifics for the devices are still to be determined. 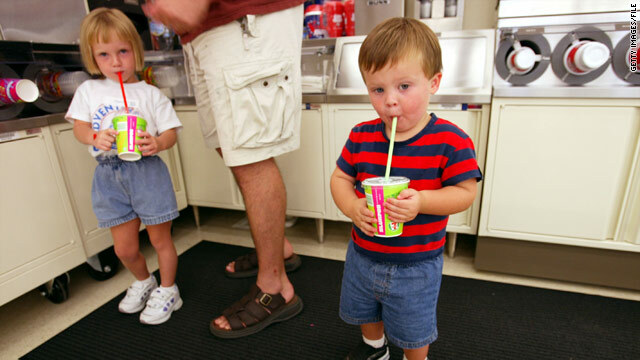 7-Eleven first served up free birthday Slurpees in 2002, when these two Florida youngsters capitalized on the promotion. 7-Eleven birthday means free Slurpees for heat-ravaged U.S.
Sure, it's a marketing ploy, but the timing is apropos. As sweltering heat in 15 states is pushing the mercury to record levels, 7-Eleven is celebrating its 84th birthday by handing out 5 million Slurpees between noon and midnight Monday. CNN reported earlier Monday that almost a third of U.S. states are likely to see temperatures top 105 degrees this week. Wichita, Kansas, saw 111-degree temps Sunday. Oklahoma City set a new record at 108. All in all, it's nasty out there, and it's a good thing the free 7-Eleven icy beverages are only 7.11 ounces. Otherwise, they wouldn't stand ... well, a Slurpee's chance in Wichita. Sorry, couldn't resist. Filed under: Business • Kansas • Oklahoma • U.S. It's hot. And if it’s not hot where you are now, it probably will be shortly. A heat wave has it sights set on the Midwest, the Plains and the Southeast this week. Temperatures are expected to rise above 105 degrees. Our advice: Sit back and relax inside your air-conditioned spaces because you've gotta watch the best way to beat this summertime sizzle. Shuttle Atlantis continues its final voyage as Washington remains entrenched in the debt ceiling debate. Watch CNN.com Live for continuing coverage on these developing stories. 9:30 am ET - Shuttle mission status briefing - NASA officials update the public on the final mission of space shuttle Atlantis. 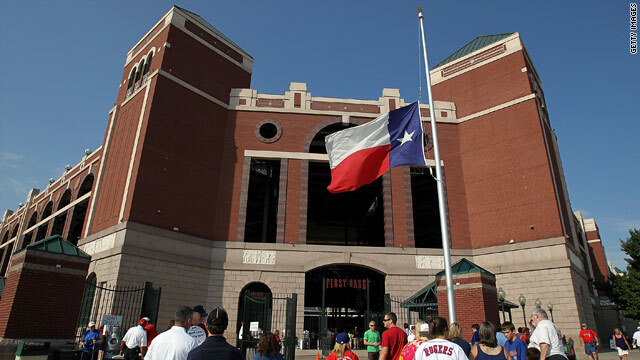 The Texas flag flies at half staff for fan Shannon Stone at Rangers Ballpark in Arlington, Texas. Rangers' fan's funeral: Funeral services will be held Monday for a Texas man who died at a baseball game last week. Shannon Stone will be buried in his hometown of Brownwood, Texas. The 39-year-old firefighter fell to his death Thursday while trying to catch a ball at a Texas Rangers game. In the second inning of the ill-fated game, star outfielder Josh Hamilton tossed a souvenir ball into the stands after a batter hit a foul ball. Stone stuck out his glove and reached for the ball, but lost his balance and flipped over the railing of the outfield seats. He fell about 20 feet and crashed head-first into a scoreboard, suffering fatal injuries. Stone died of blunt-force trauma, according to the Tarrant County medical examiner. Nuclear checks in Japan: Japan's Chief Cabinet Secretary Yukio Edano announced Monday a new round of safety tests for the country's nuclear plants in the government's latest bid to gain the public's confidence.